Whilst Mimmo Cozzolino undertook the concept development and research for Symbols of Australia over a number of years, the final design, editing and writing was a vigorous collaboration, spanning some 18 months, between Mimmo and his friend Fysh Rutherford. Mimmo and Fysh first developed a professional relationship when Mimmo was the front man for the All Australian Graffiti Studio. 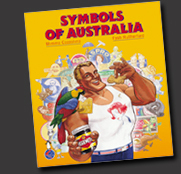 Australian Graffiti had long been admirers of the ‘Iron Outlaw’ comic strip that had been created and written by Fysh. Conversely, Australian Graffiti’s sense of humour and migrant sensibility had great appeal for Fysh, an Australian who had grown up in Hawthorn along with Italian and Greek kids. It wasn’t long before Fysh started helping with the copywriting of the studio’s promotional material, including the highly successful Kevin Pappas Tear Out Postcard Book (Penguin, 1977). The collaboration on Symbols of Australia became a natural progression and cemented a strong friendship that still exists today.